<p>It integreates virtual reality. It takes dronies. It's hackable. 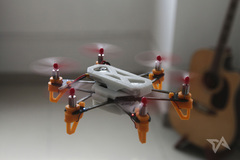 </p> <p>ELF is your nanocopter that fits into your pocket and high definition (HD) aerial photo robot that anyone can capture videos and photos from the sky. ELF features both cutting-edge technologies and fully hackable platform, all specifically designed for ease, joyful and affordable piloting experience. </p> It connects directly to smartphone app (iOS &amp; Android) via Bluetooth 4.0 and takes off in an instant when you throttle. Simplified wifi connected ELF VRdrone application allows you to capture special moments and share online in real time. No flying skills required, no stereotyped perspective, just great-looking live videos in 3D. <br><br>The ELF is quite modular. The drone hull, motor mounts and supports are 3D printed. No soldering, no screw is required. Users can decide how their drone looks like depending on the personal preference.